Karma is sometimes a lady. Not quite three weeks ago, I climbed a dome near Polvadera Peak and noted that the view included part of Canon del Cobre, and ruminated that this would be a fun area to get into at some point. 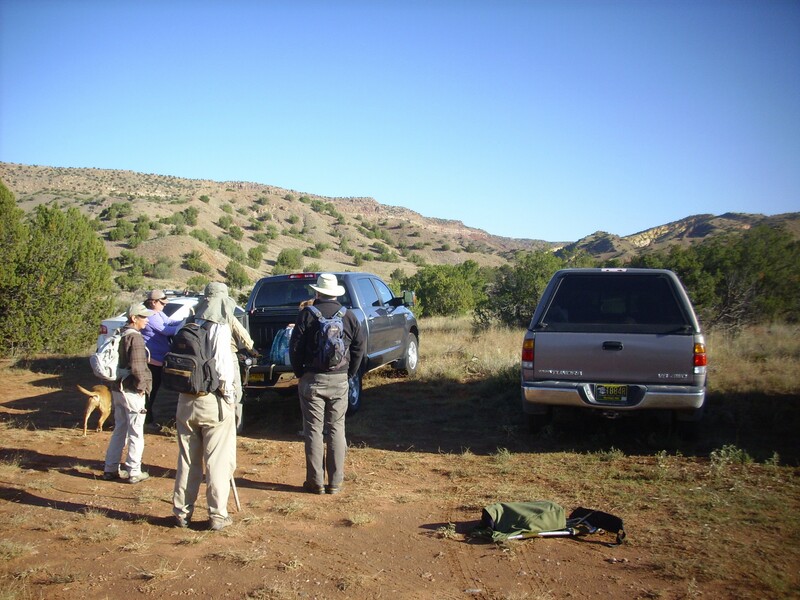 Sure enough, the next Los Alamos Geologic Society newsletter mentioned that the September field trip would be to Arroyo del Cobre. No, not quite the same thing, but awfully close. So I got up early (for a weekend — same hour I usually get on on a work day), ate breakfast, let the dog out, packed my pack with the usuals, and drove out to Sullivan Field to meet the other hikers. A fellow named Tom offered to let me ride with him, and we headed on out to Bode’s General Store in Abiquiu. The ride out was pleasant. It was actually somewhat foggy in the valley, from what amounted to the first fall cold front coming through the area, and fog is a pleasant rarity in northern New Mexico. It was also rather cool, so I found myself wearing a sweater the entire morning. After a couple more Society members joined us, we headed on to Red Wash Canyon, took the dirt road to the north, and parked in the small parking area. From here it was north along an old jeep trail to the southern rim of Arroyo del Cobre. Along the way, I noticed that there was a fairly nice view up Arroyo de los Frijoles towards Polvadera Peak, and took a snapshot. At right is Canones Mesa, which has prominent white exposures of Abiquiu Formation under a cap of basaltic andesite with an age of not quite 3 million years. 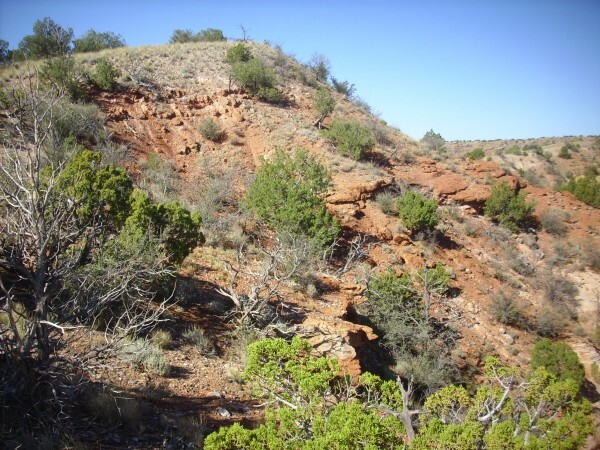 This basaltic andesite is sometimes assigned to the Tshicoma Formation, which makes up the Sierra de los Valles west of Los Alamos and extends north to include Tshicoma Mountain and Polvadera Peak. 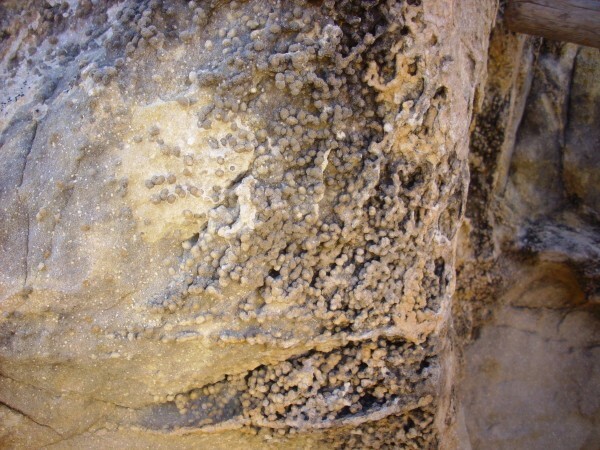 However, it’s not typical of that formation, being poor in phenocrysts (large visible crystals in the solidified lava that were present when it erupted) and it is nowadays placed by itself. 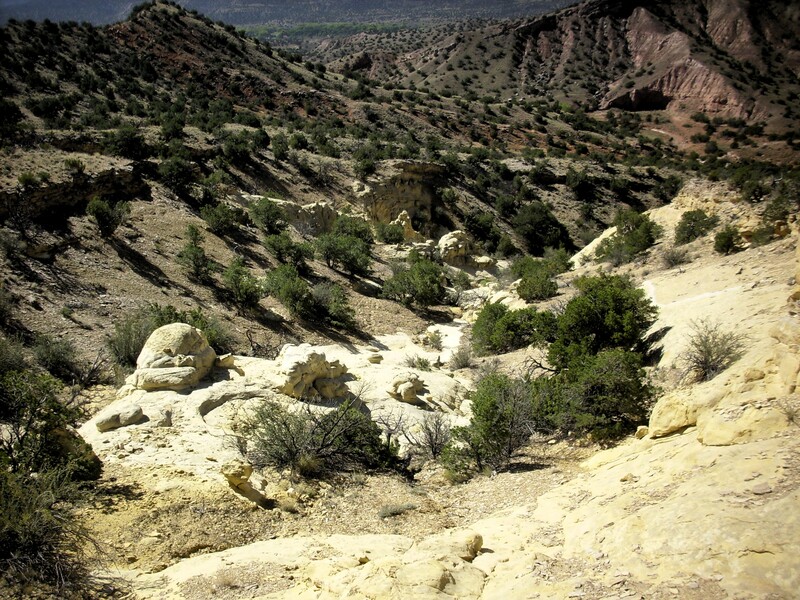 The Abiquiu Formation is much, much older, being at least 25 million years old, and is one of the oldest of the rift fill formations of the Rio Grande Rift. It gets its white color from abundant ash, though to originate in the San Juan volcanic field to the northwest and the Latir volcanic field to the northeast. At left is El Alto, which is underlain by the Ojo Caliente Member of the Tesuque Formation and capped with Lobato Mesa basalt with a radiometric age around 9 to 10 million years. 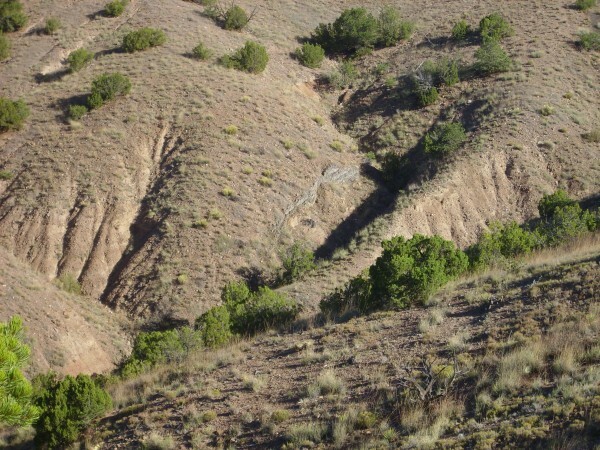 The Ojo Caliente Member is another rift fill formation, but a much younger one than the Abiquiu Formation with an age 5 to 15 million years old. 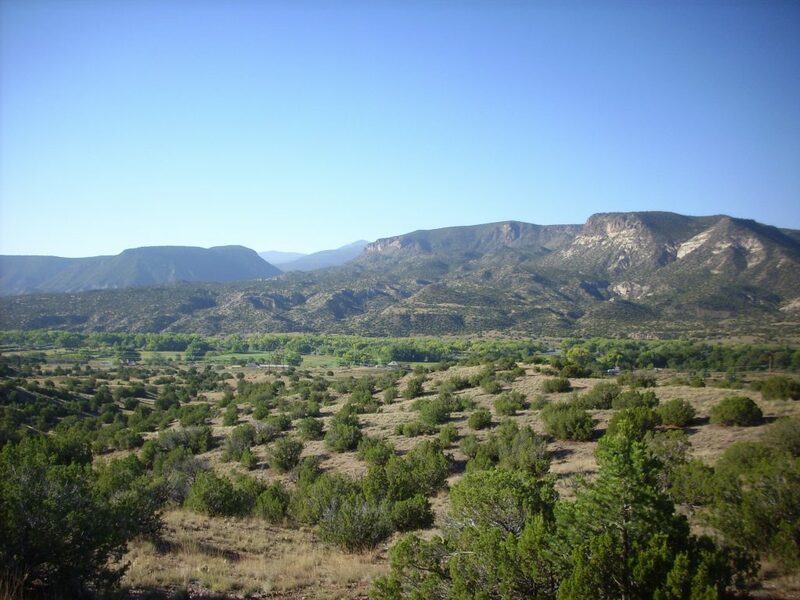 Through the notch between (Arroyo del los Frijoles) you can see part of the Tschicoma Highlands, including Polvadera Peak, the third highest peak in the Jemez Mountains. Northwest of the trail, our guides pointed out a small dike. 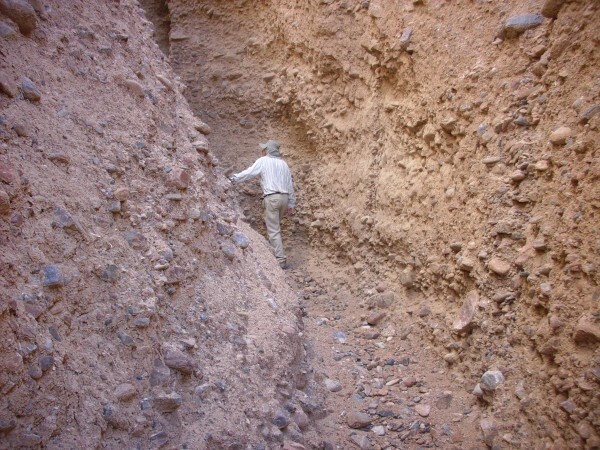 This is likely part of the Cerrito de la Ventana dike system, which has a radiometric age of about 20 to 25 million years. Because it intrudes the surrounding beds, we know these must be at least this old. 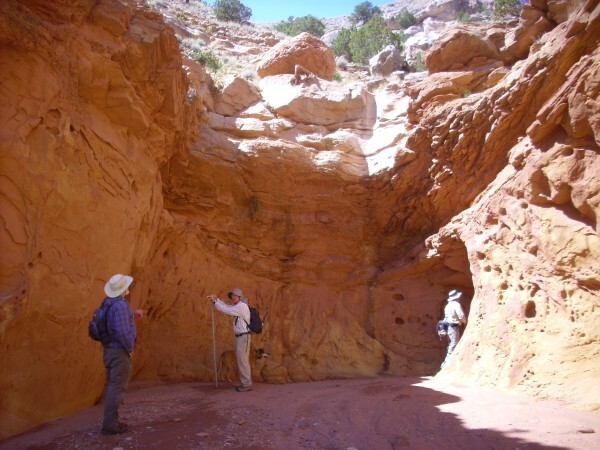 These beds are part of the Ritito Conglomerate, which includes beds formerly mapped as lower Abiquiu Formation. The Ritito Conglomerate is a poorly cemented, poorly sorted conglomerate rich in rock fragments from the Tusas Mountains to the north. Our guides told us that dikes in soft sediments like this tend to meander rather more than dikes in more competent rock. I was struck by the very level surface of Abiquiu Mesa to the east, topped by El Alto basalt that flowed down a valley in the higher El Alto plateau. 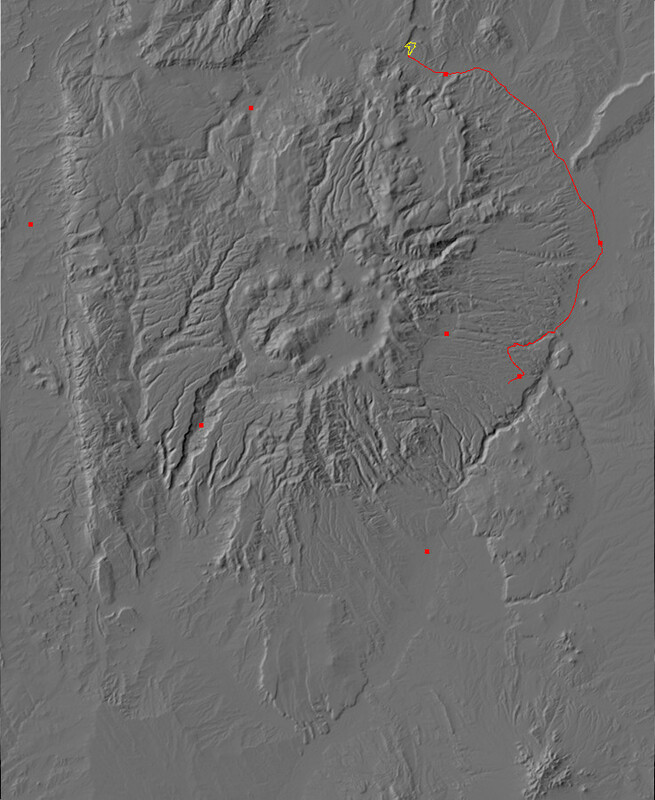 The El Alto Basalt is slightly younger than the basaltic andesite of Canones Mesa, since it partially overlaps the latter. In fact, the published radiometric age is slightly older, but this reflects inherent uncertainty in the age measurements. 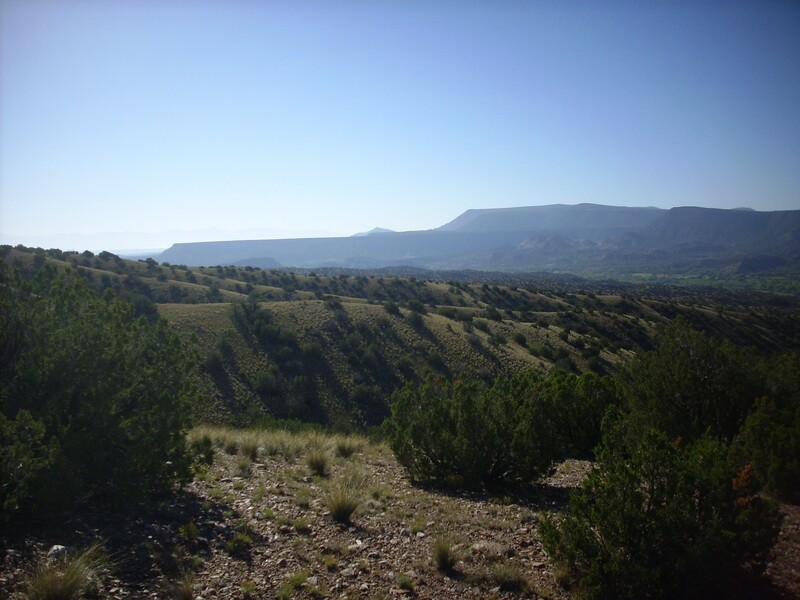 And then the southern rim of Arroyo del Cobre and the first panorama of the day. The key feature here is the Canones Fault Zone, whose main strand runs across the floor of the canyon from left to right. 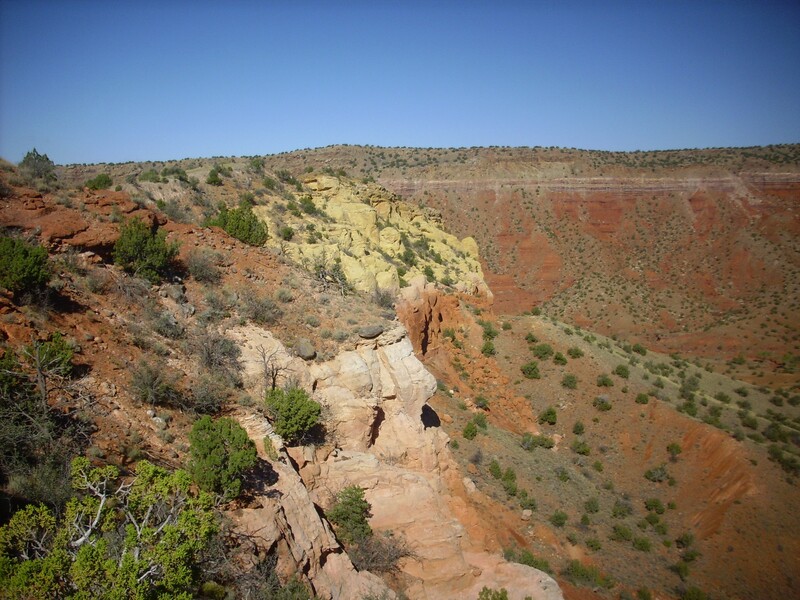 This fault zone is generally taken to mark the boundary between the Rio Grande Rift (on the near side) and the Colorado Plateau (on the far side), two major tectonic provinces. The rock beds on the near side of the fault zone are thrown down a considerable distance, so that the Jurassic rocks forming most of the rim we’re standing on are considerably younger than the Triassic rocks forming the far rim. Just how great the displacement is is demonstrated by the presence of the white beds in the center of the valley floor. 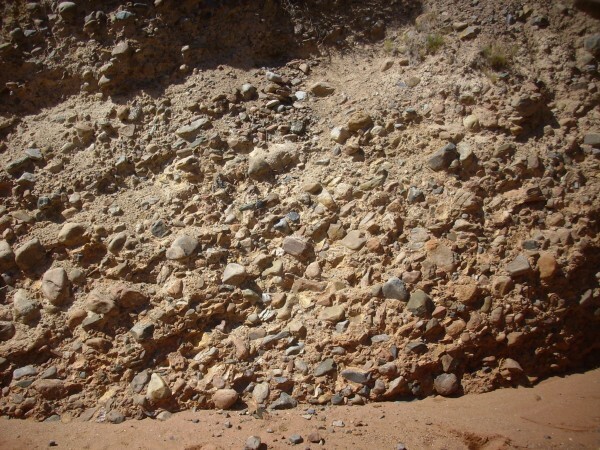 The main strand of the fault zone runs just beyond them, and they are the same formation (Poleo Sandstone) as the far canyon rim on the other side of the fault. The cliffs in the foreground in the first frame are Jurassic Entrada Sandstone, with a thin covering younger Tertiary El Rito Formation and Ritito Conglomerate. There was once a bed of Jurassic Toldilto Formation above the Entrada Sandstone, as shown by the yellowish color; this is characteristic of the uppermost Entrada Sandstone, just beneath the Todilto Formation. 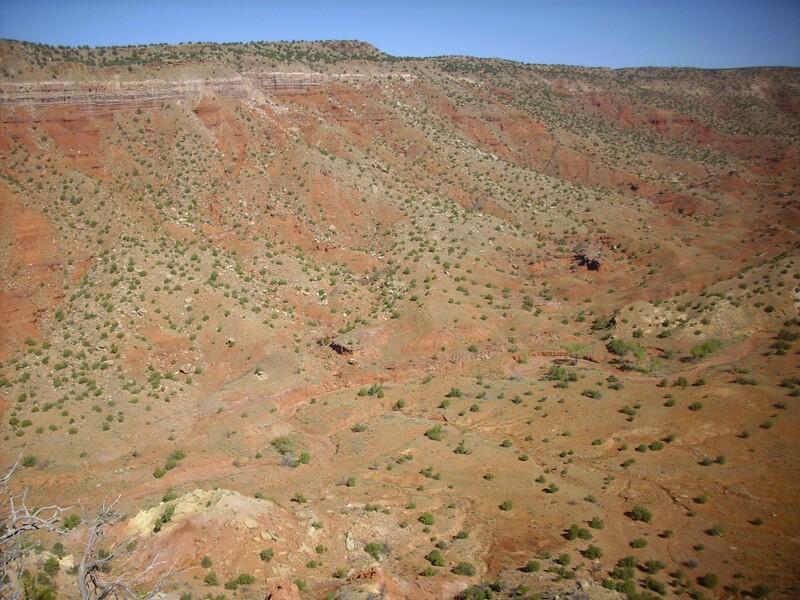 A few weathered remnants of the Todilto Formation lie between the Entrada Sandstone and the El Rito Formation, and on the far side of the cliffs, as we’ll see later, the Todilto Formatino is much better preserved. The far canyon wall is underlain by dark red Arroyo del Agua Formation, the upper formation of the Permian Cutler Group. 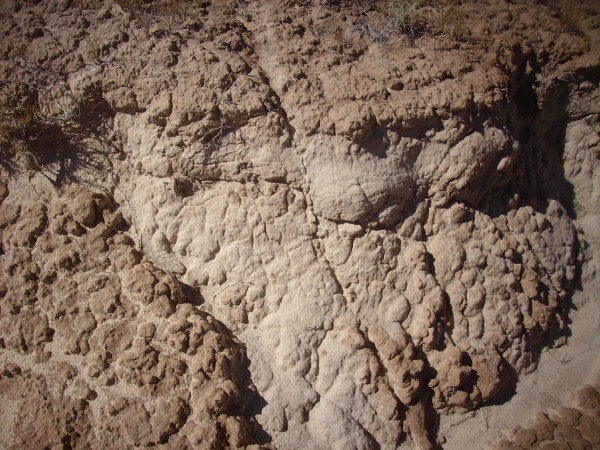 The lower formation, the Canon del Cobre Formation, is exposed in the valley floor and in the Canon del Cobre further north. 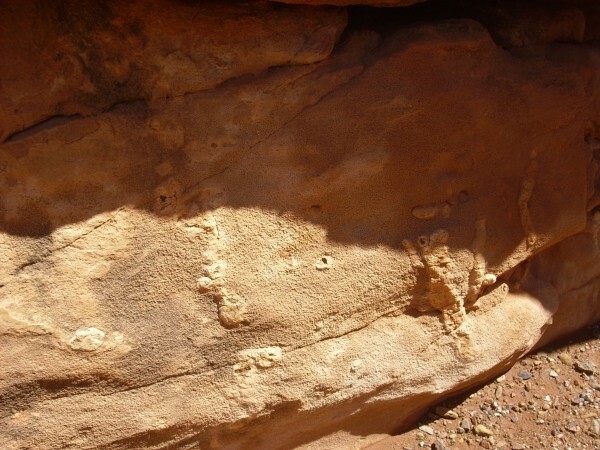 These are capped by the tan beds of the Poleo Sandstone of the Triassic Chinle Group, with a significant discontinuity (gap in the geologic record) between them. A little further on, and we came to a view of the upper part of the arroyo. The mesa in the middle of the panorama is El Puertocita, and Canon del Cobre proper is located beyond. The Canones Fault main strand runs just in front of El Puertocita, and if you examine closely you will see some beds of Poleo Sandstone at its eastern foot corresponding to those capping the mesa. The “wedding cake” hill in the near distance in the fourth and fifth frame is Entrada Sandstone capped with Todilto Formation, above which are El Rito Formation and Ritito Conglomerate. This knife ridge was also a good place to get a panorama to the south. At left, Abiquiu Mesa and, at a higher level, El Alto. On the right side of the second frame, Arroyo de los Frijoles with Polvadera Peak on the skyline. The third frame is filled by Canones Mesa with its exposures of Abiquiu Formation, and Cerro Pedernal, beloved of artist Georgia O’Keefe, stands at the right side of the third frame. We turned around and began working our way along the south canyon rim. Most of the canyon rim is underlain by Tertiary El Rito Formation red beds. 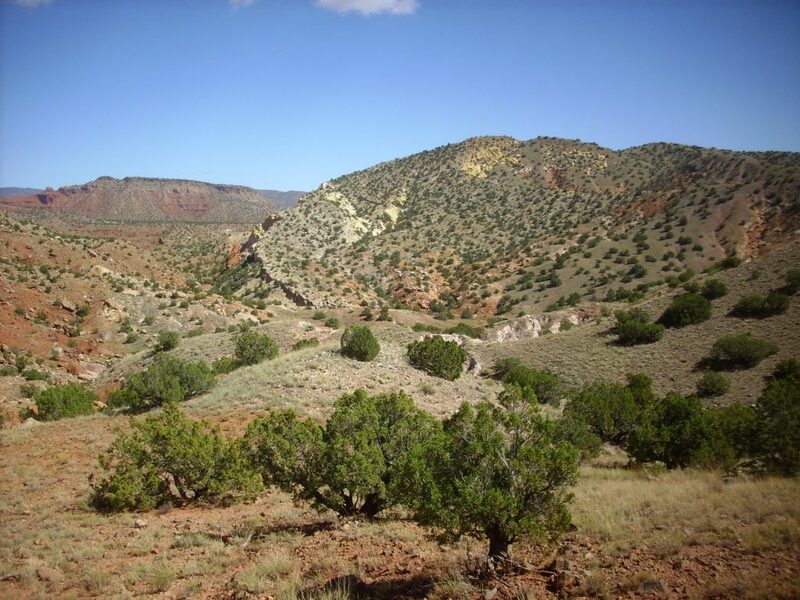 The El Rito Formation is somewhat difficult to date, having very few fossils, but is probably from the Eocene — in the ballpark of 40 million years old. This is older than the Rio Grande Rift, and the formation was probably laid down in valleys between highlands of the Laramide orogeny. I noticed as we hiked over the outcrops that there were tiny flakes of mica, consistent with samples of the El Rito Formation I’ve picked up elsewhere. 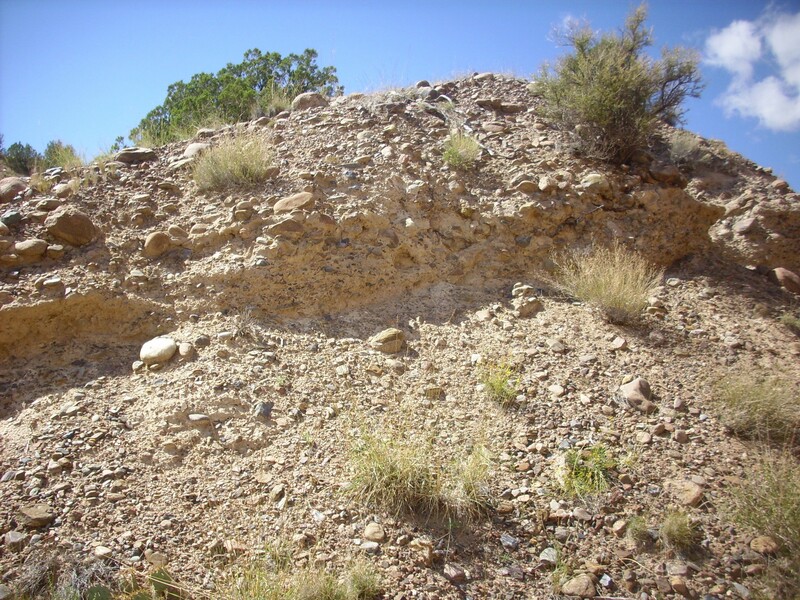 Mica is not terribly common in sandstones and so serves as a distinguishing feature of the El Rito Formation. Beneath the El Rito Formation, across a substantial discontinuity where at least 100 million years of geologic history is missing, is the Jurassic Entrada Sandstone. Here‘s a nice outcrop. Notice how the lower portions are a deep red while the upper portion is yellow-tan. 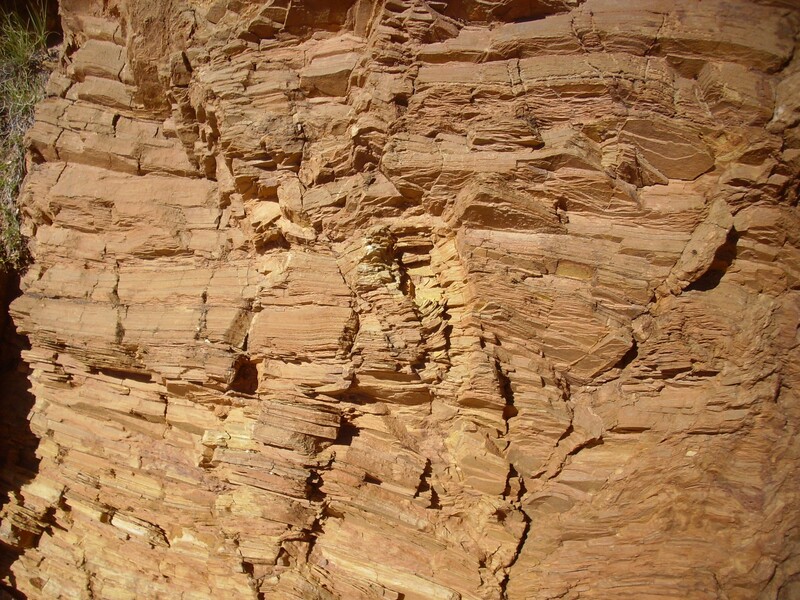 This is a consistent feature of the Entrada Sandstone everywhere it is, or was, overlain by the Todilto Formation. The Toldilto Formation is limestone and gypsum laid down in a shallow lake or arm of the sea that became cut off and evaporated. 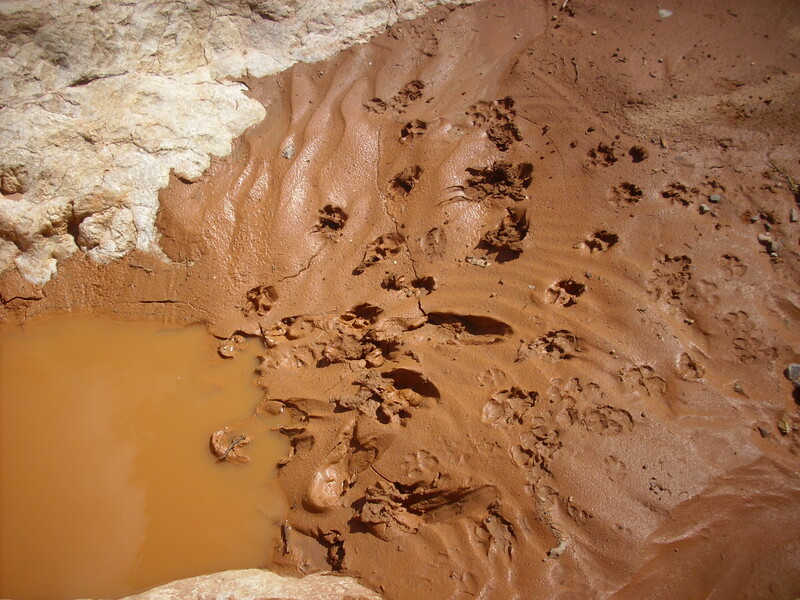 The anoxic waters of this sea penetrated the upper layers of the Entrada Sandstone, reducing the red ferric iron in the sandstone and removing it as soluble ferrous iron. The Jurassic column in this area is beautifully exposed to the south. The red to yellowish beds are Entrada Sandstone. Atop is a thin layer of limestone of the Todilto Formation. To the left is a pinkish exposure of the overlying Summerville Formation, also of Jurassic age. Though not well exposed, my geologic map shows that the Morrison Formation is present at the top of the hill, and some thin beds of Cretaceous Burro Canyon Formation. I did not notice these at the time, but the Summerville Formation stuck out like a sore thumb. The dog belongs to our guides on this hike, Shari and Rick Kelley, and is named Yeso. 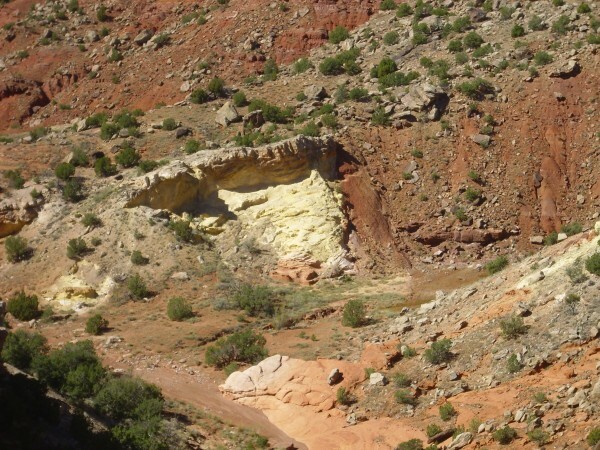 The Yeso Group is a prominent redbed unit south of the Jemez, and the dog (now somewhat elderly) had just about that color of coat when younger. The woman in the blue jacket also brought her dog, which is about four years old. It was amusing to watch Yeso patiently plodding along with the hoomans while Bandit raced back and fourth smiling at us. However, by the time the hike was finished, Bandit was less smiling than panting. Shari Kelley is lead author on the geologic map for the Canones quadrangle. It’s nice to now be able to put a face with the map, which I have perused many times before when planning adventures in this area. 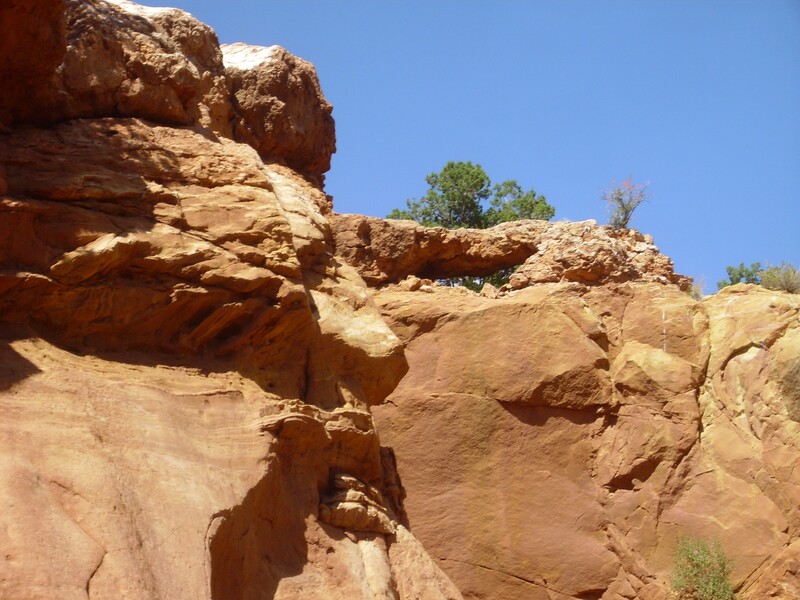 Our guides drew our attention to some features in the Entrada Sandstone at the canyon rim. These are calcite concretions, sometimes called “blueberries” (though the term is more applied to hematite concretions.) I did not think to ask how they form, and I haven’t found much online; it’s not clear to me we actually know. 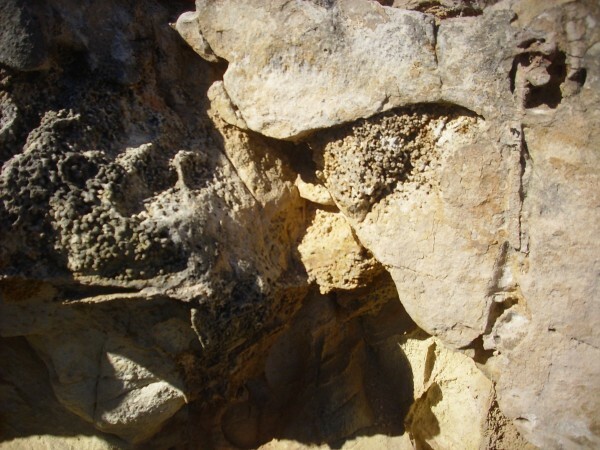 The structures in the upper right corner may be rhizoliths, a form of fossilized plant root. Across the canyon from this point, there is a dike visible in the canyon wall, which apparently intruded along a fault (judging from my geologic map). 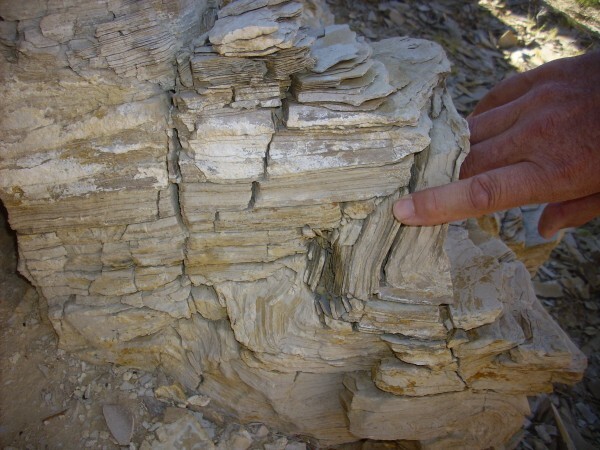 The rim here is thinly bedded limestone of the Todilto Formation, which is normally devoid of fossils. 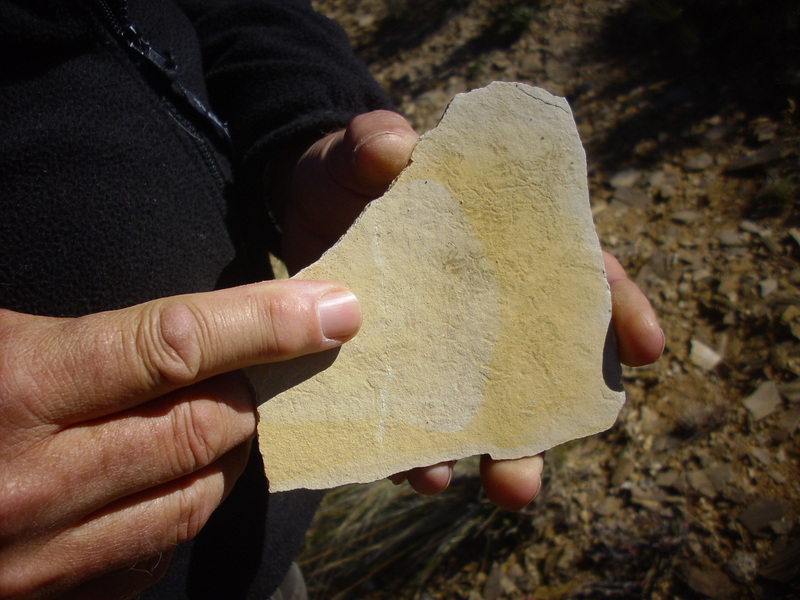 However, one of the group did find a shard with faint algae impressions on it. Some mushroom hoodoos in the Entrada. Getting closer would have required significant scrambling and my shoulder is still not up to it. As we approached the fault zone, the rock beds became increasingly fractured and distorted — particularly the thinly bedded limestone of the Todilto Formation. To the south, the fault crosses a saddle where the trace becomes obvious. The fault trace is directly to the right of the yellowish outcrop of Entrada Sandstone capped with Todilto Formation. 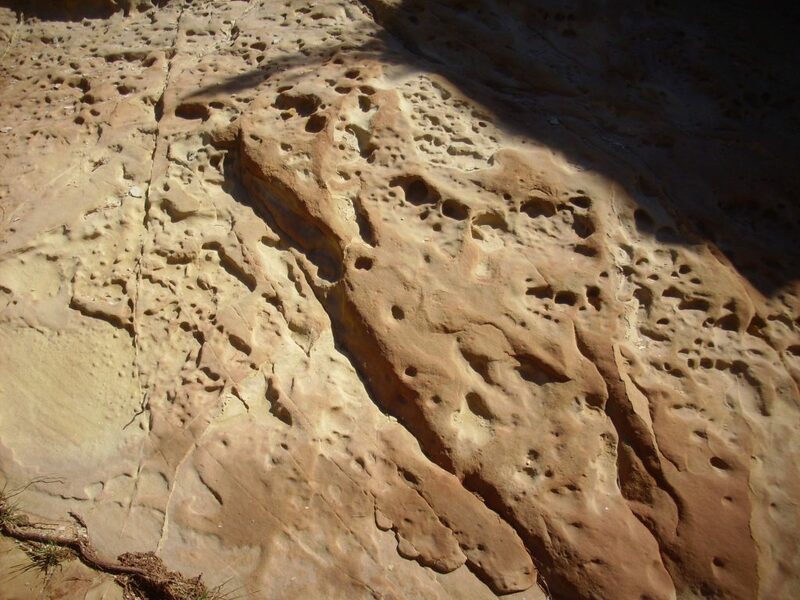 These Jurassic formations have been thrown down until they are in contact with Permian Arroyo del Agua red beds. This has got to be about the most spectacular fault trace imaginable, apart from freshly ruptured ground above a fault that has just undergone a major earthquake. We descended towards the fault trace. Some of the Entrada Sandstone along the way was eroded in a cool enough fashion to be worth a photograph. 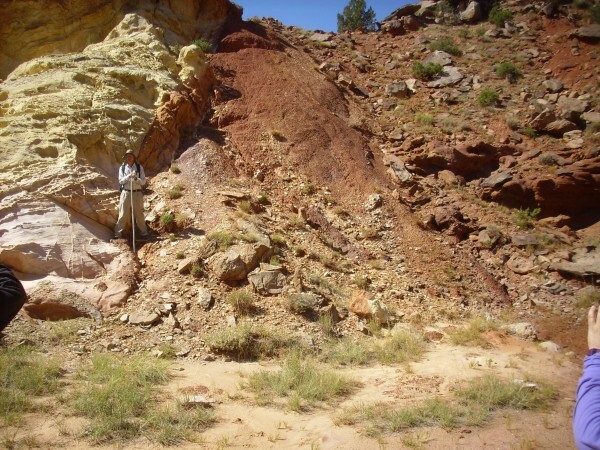 The zone of fine red material is the fault trace itself, which is filled with fault gouge apparently dominated by the soft redbed sediments of the Permian side of the fault. We lingered here for a few minutes. There is a spring arising almost exactly on the fault trace (behind us as we’re facing here) and I stuck in a finger and took a taste. As I was warned, the water is very brackish; it must flow through the Todilto Formation, or some other formation rich in partially soluble minerals, at some point. Because the water is brackish, it does not support a local flourishing of vegetation; the spring is dominated by sparse salt grass instead. We hiked up the saddle to where we were told there were petroglyphs. The path crossed the Summerville Formation, and I took a close up photograph for the book. I’ve never managed to get this close to the Summerville before. I thought about taking a sample, but nothing here was well enough cemented for me to bother. Basically muddy sand. It reminds me a little of the much younger Ojo Caliente Member of the Tesuque Formation, and I find myself thinking this would be an excellent source formation for the Ojo Caliente. One last look north up Arroyo del Cobre. 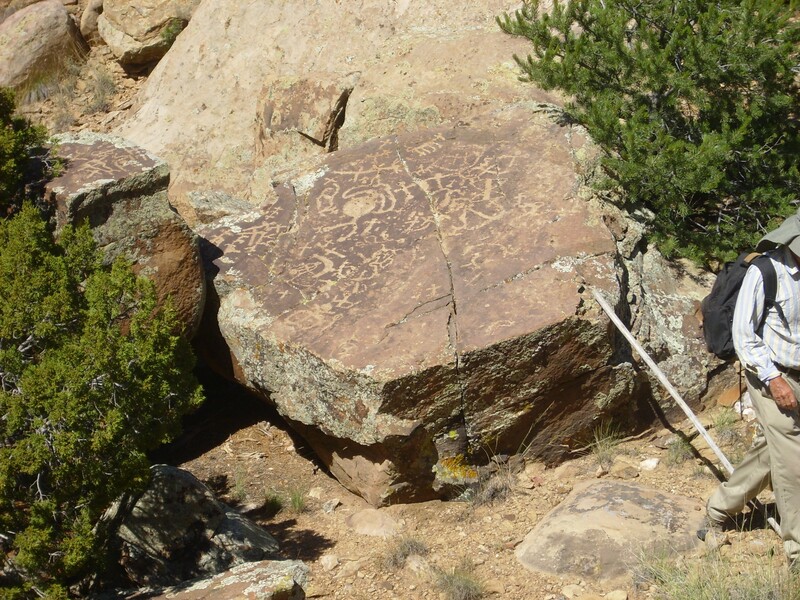 Arriving at the top of the saddle, we found that, sure enough, there was a boulder well covered with petroglyphs. These seem somehow different from other petroglyphs I’ve seen. I wonder if they are from a culture different from the Ancestral Pueblo People. We kicked back and ate lunch. I found myself with a face full of Yeso, who was delighted when I scratched him behind the ears. Alas, since I was reclining on the ground when he came by, this also meant plenty of doggy breath. So it goes. This is a nice contrast of ordinary contact with discontinuity. 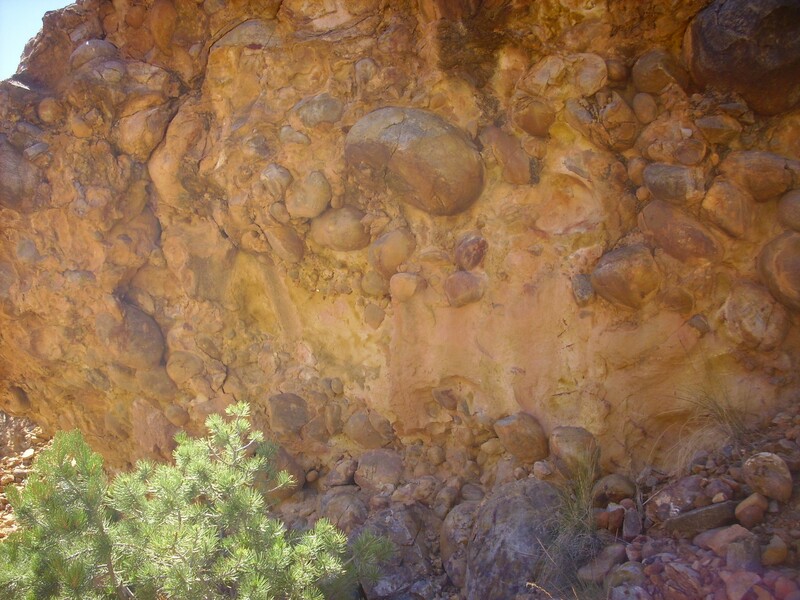 The yellow massive rock is Entrada Sandstone, and its bedding conforms with the thin capping layer of Todilto Formation at left. At upper right, however, we have an angular unconformity, with beds of Ritito Conglomerate laid down on an eroded surface of the Entrada Sandstone. Here‘s some Ritito Conglomerate close up. This is not actually typical of this formation, of which we’ll see numerous more typical exposures in a minute. The conglomerate is unusually well cemented here and the cement has a distinct reddish color. This seems characteristic of the base of the conglomerate. The guides took us up the arroyo for a little surprise. This must be a fun place during cloudbursts. Bobcat tracks, mingled with more recent dog prints. The dogs were not particular about the quality of their water supply. Again, the guides led us into the arroyo, for another little surprise. On the way back to the trail: Worm tubes or, more likely, rhizoliths in the Entrada Formation. A bank of Ritito Conglomerate I figured was good enough for the book. 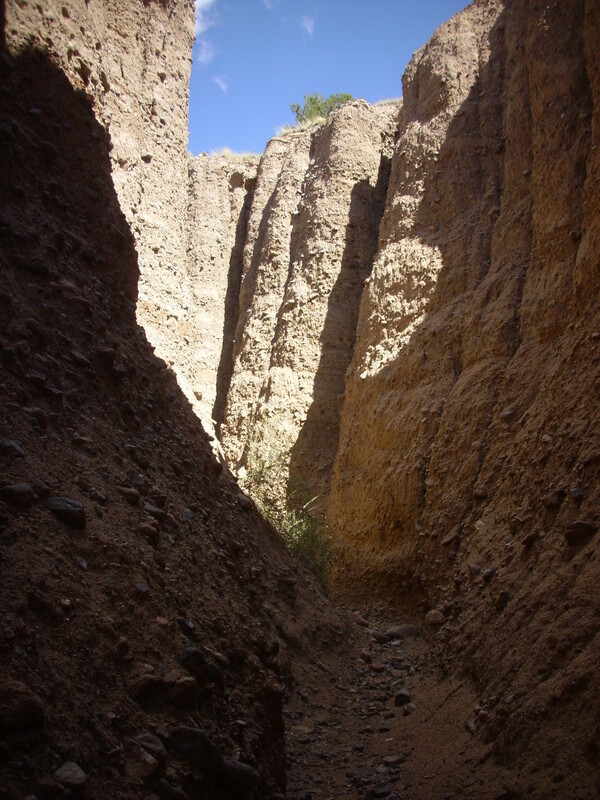 A slot canyon in the Ritito Conglomerate. That’s Tom ahead of me. The clasts in the conglomerate here are varied and interesting, including epidote and garnet-bearing metamorphic rocks. And that was it; up the east bank of the arroyo, and we were back at the cars. As Tom noted, a perfectly wonderful way to spend a Saturday. 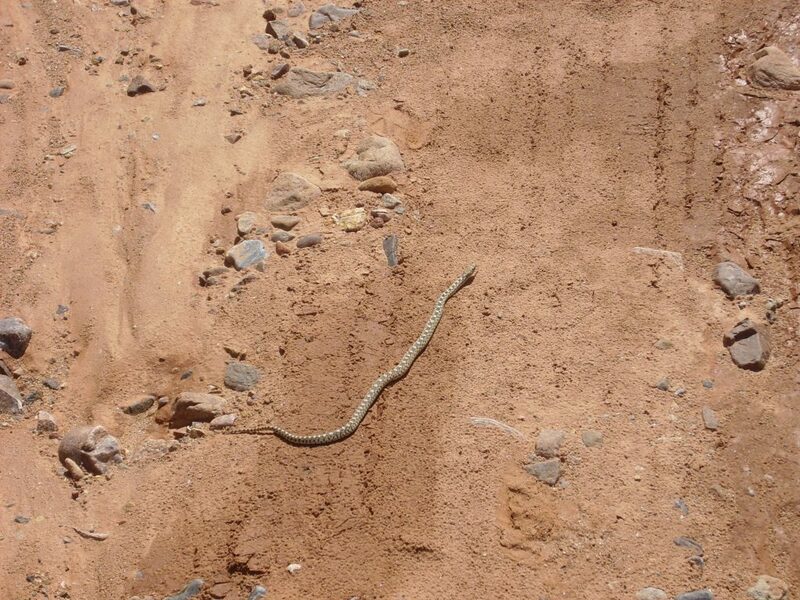 I should clarify that it was the snake that did the hissing and lunging, and not the member of our party.